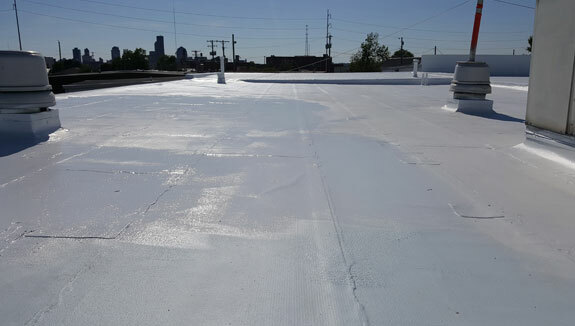 If your commercial roof is showing its age, a liquid applied roofing membrane can restore it without costly roof replacement. A roof coating is a cost-effective way to fix leaks and aging to extend the life of your roof. We offer many types of liquid applied roofing that cure to form a watertight and rubber-like membrane over your existing roof. This solution can be used on nearly all types of roofs, including metal and EPDM. We take pride in helping Dayton facility owners save time and money on roof repairs and replacement. Learn more about your options with fluid applied roofing and how it can save you thousands. Roof coatings create a durable barrier that protects your roof from the elements while sealing leaks and tears. A spray-on roof coating can be applied to a new or aging roof system to extend its life. Most facility owners turn to roof coatings as an alternative to costly and disruptive roof replacement. Not sure if fluid applied roofing in Dayton, Ohio is the right choice for your facility? Consider the following benefits. Fluid applied roofing creates a fully restored and weatherproof surface, even if your roof has patches, leaks, and punctures. The system is sprayed on across the entire roof, around pipes and equipment, to create a complete leak-proof seal. A fluid applied roof is the only seamless roof available, creating a flexible, durable roofing membrane. No seams, No leaks. A fluid applied roofing system can restore your aging roof and save 20-50% compared to the cost of replacing your roof. 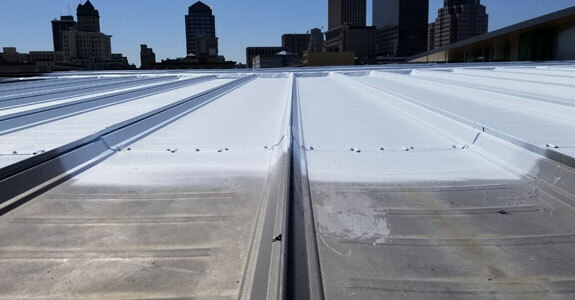 Restoring a roof with a fluid applied roof is faster, less expensive, and less disruptive to your facility than a full tear off and replacement. Since a roof coating is applied directly over your existing roof system, installation is fast and easy. This type of system is not labor-intensive like a tear-off and replacement so its faster, easier, better. A liquid applied coating can last for many years, 10-20 years. When the system begins to wear out, there’s still no need to tear off your roof. A new fliud applied roofing system can be applied to renew its reflectivity, ensure its waterproofing abilities, and extend the life of your roof. A truly sustainable roofing solution. A reflective white fluid applied roofing membrane on your roof offers great UV protection. Exposure to UV rays is a common cause of roof failure, but a roof coating can add years of additional service life to your roof. It can also reduce the building’s interior temperature and reduce air conditioning use. Replacing your roof can require shutting down your business temporarily. Applying a fluid applied roofing system does not require closing your business during installation. There will be very little noise or disruption so you can continue business as usual. Restoring your roof allows you to recycle your existing roofing materials, reducing landfill waste. Many roof coatings also qualify for the Green Building Council’s LEED program with ultra-low or no VOCs. With eGreen Roofing Solutions, the difference is clear! Fluid applied roofing, Liquid Rubber and Roof Coating are all terms used to describe this seamless sustainable roofing system. 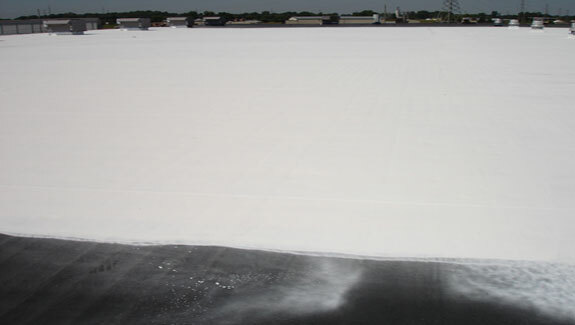 This rubber roof coating is applied as a liquid and immediately waterproofs virtually all types of commercial roofs. Liquid Rubber is a multi-coat product that creates a seamless, reflective, and flexible membrane. Commonly used to restore EPDM roofs, it can also be used to restore other single ply roofing systems. Like many EPDM rubber roof coatings, Liquid Rubber will contract and expand with changing temperatures and reduce the risk of leaks at seams, flashing, and edges. Its reflective white will even reduce your facility’s temperatures and energy use. Metal roofs are well-known for their durability and waterproofing, but they can sometimes develop leaks. 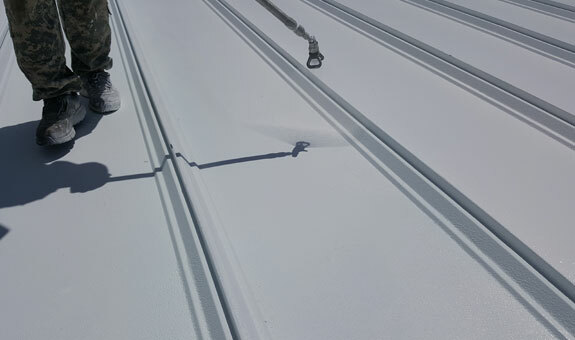 We use a sprayable metal roof coating to stop leaks for good. Fluid applied roofing systems can seal out moisture, stop rust, and renew an aging metal surface. If your metal roof is new or in good condition, you may still want to consider a spray on roof coating. A roof membrane can improve your roof’s resistance to weather, improve UV reflection, and extend the life of your roof for years. Flat roofs tend to have more problems than sloped roofs, especially when it comes to seams, leaks, and ponding water. Fluid applied roofing systems or roof coatings are the standard for restoring and preserving flat roof systems. A well known roofing system in the industry is FAR System which is a fiber infused polyurethane-acrylic roof coating which can withstand ponding water and it does not require reinforcing fabric during installation. This is cracking of a built-up roof caused by UV exposure. These cracks can allow water to penetrate the roof system. A roof coating can restore the surface to a solid, weatherproof membrane. When it snows or rains on a flat roof, the water has nowhere to go. The water will settle into areas that are dipped or low, shortening the lifespan of the roof and increasing the risk of leaks. Over time, as the building settles and shifts, the roof membrane will begin to buckle and move. This can leave open seams, tears, and gaps around flashing. A flat roof coating restores the roof with a single seamless membrane. A polyurethane-acrylic roofing system offers the greatest benefits. (PUA) or polyurethane-acrylic is the standard for roof coating in Dayton, Ohio because it has excellent UV resistance, no chalking, and unsurpassed water resistance. A PUA roof coating can restore a roof that is old, worn out, or in need of roof maintenance that is not structural. This type of liquid membrane protects your roof from the elements with a seamless waterproof membrane that can even resist ponding water. With its reflective surface, a PUA fluid applied roofing product will keep the surface of your roof cool to reduce energy costs. When a PUA roof membrane begins to wear out, the roof does not need to be torn off. We don’t even need to strip the coating. Instead, a new coating is re-sprayed directly onto the previous membrane for a roof that is good as new. Most PUA fluid applied roof coatings last 10-15 years or more. An alternative to a polyuretahne-acrylic is a straight acrylic roof coating, which can be used on metal roofs and more. An acrylic coating offers great long-term performance with reflectivity, excellent corrosion resistance, and resistance to UV rays. Unlike a PUA or polyurethane-acrylic, a standard acrylic roof coating will not perform well in ponding water conditions and has a slower cure time. Cool weather can slow the cure time even more. A silicone roof coating is one of the most expensive types of coating. Silicone is a solution used in Dayton, Ohio because it has excellent UV resistance, no chalking, and unsurpassed water resistance. A silicone roof coating can restore a roof that is old, worn out, getting very hot, or failing in some way that is not structural. This type of liquid membrane protects your roof from the elements with a seamless waterproof membrane that can even resist ponding water. With its reflective surface, silicone will keep the surface of your roof cool to reduce energy costs. When a silicone roof membrane begins to wear out, the roof does not need to be torn off. We don’t even need to strip the coating. Instead, a new coating is re-sprayed directly onto the previous membrane for a roof that is good as new. Most silicone roof coatings last for about a decade. Fluid applied roofing is a time-testing and cost-effective way to save your roof from failure. Not sure if your roof is in good enough condition for a liquid membrane? Curious about the cost? We’re just a call away. Here are some common questions we hear, but feel free to reach out with additional questions you may have or to request an estimate. What is fluid applied roofing? A liquid applied roofing system is a product made from silicone, acrylic, or polyurethane. This type of membrane is applied to your roof as a liquid, either with rollers or sprayed on. Once it cures, it becomes a seamless and weatherproof membrane that restores your roof to good as new. Fluid applied roofing can restore your roof to help you avoid the cost and hassle of replacement, or it can be used to reduce energy costs with its reflective ability. Yes, a roof can be coated as long as it is not severely damaged. There are benefits to applying a roofing coating to a new roof. Liquid applied roofing can improve the durability of your new roof. A reflective coat will also offer unparalleled UV protection for your roof to add years to its lifespan and reduce roof maintenance costs. Most liquid applied systems can be simply reapplied every decade or so to renew the benefits and ensure a watertight seal. Almost any type of roof can be coated. There are dozens of roof coating products on the market today, including roof coating for shingles, metal roofs, EPDM and single ply roofs, and more. A coating can be applied to a flat, sloped, or domed roof. Without a special treatment, a ballasted and gravel surface membrane is not an acceptable roof for coating. We will inspect your roof and its condition to determine if it can be coated and which product is appropriate. If your roof has ponding issues, for example, we will select a flat roof coating specifically designed to withstand ponding. How will my roof be prepared for a coating? The most essential step for flawless results is careful surface preparation. Your roof will be cleaned thoroughly and allowed to dry. If the roof is pressure washed, care must be taken to prevent damage to the underlying membrane, especially at the seams. A primer is not a substitute for cleaning, but some substrates and coatings do require a primer first. If you have a rusted metal roof, the rust must be addressed first. Red rust must be removed and treated with a primer to inhibit corrosion. White rust on zinc or aluminum should be cleaned before coating.